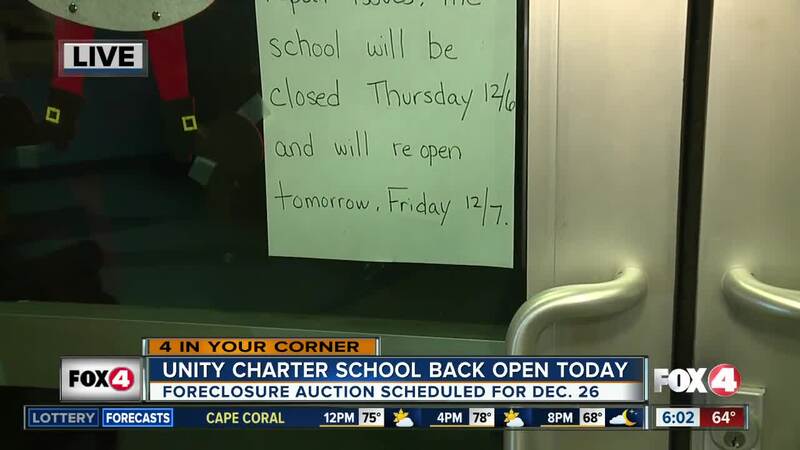 CAPE CORAL, Fla. -- Parents at Unity Charter School were shocked to hear that the school suddenly closed on Thursday. Parents tell Fox 4 they received an automated message Wednesday evening reporting that there would be no school Thursday, due to circumstances beyond their control. Calls and emails to the school on Thursday have been met with no response. We took a trip to Unity Charter School on Thursday and found a note on the front door stating: "Due to some repair issues, the school will be closed Thursday, December 6th and will reopen tomorrow, Friday, December 7th." A parent of a Unity student told Fox 4 that the school told her they were "having maintenance issues that needed to be handled" and they "were worried the water wouldn't work while the students were at school." Fox 4 has learned that the school property is undergoing a foreclosure and is scheduled to be auctioned off on December 26th. According to court documents filed with the Lee County Clerk, a final judgment was filed on November 21st after Centennial Bank filed suit on the mortgage held by the school's owners, claiming they were owed a total of $2.9 million in principle, late fees, interest, and attorney's fees. Another document filed December 3rd changed the plaintiff to Stonemark Bank. The CEO of the school's education provider had no comment and referred us to the school's lawyer. Unity Charter School hosts grades K-8 at its campus on Santa Barabara Boulevard, just north of Veterans Boulevard. We met with The City of Cape Coral Superintendent, Jacqelin Collins, and she says she had no idea Unity Charter School was in the process of being foreclosed. However, Collins offered a solution should the school ultimately be shut down. "If Unity Charter School is foreclosed, we're happy to welcome students into our classrooms." She invites you to sign up in person at Oasis High School or online at capecharterschools.org. Stay tuned to Fox 4 for more updates on this developing story.